There's a chance of rain in the forecast for Memorial Day weekend, but the sound of thunder is guaranteed. 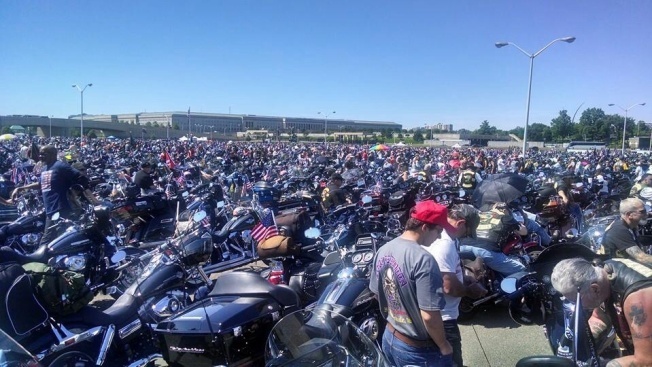 Hundreds of thousands of bikers and spectators gather every Memorial Day weekend for the Rolling Thunder "Ride for Freedom," an annual event since 1988 that honors military veterans and members of the military missing in action. Bikers rally at the Pentagon's north parking lot beginning at 8 a.m. Sunday, then ride through D.C. to the Vietnam Veterans Memorial beginning at noon. The bikers will ride across Memorial Bridge to 23rd Street, north on 23rd Street to Constitution Avenue, east on Constitution Avenue to Pennsylvania Avenue, east on Pennsylvania Avenue to 3rd Street, south on 3rd Street to Independence Avenue, west on Independence Avenue to West Basin Drive, southwest on West Basin Drive to Ohio Drive, northwest on Ohio Drive to Franklin D. Roosevelt Park where they will disband. Authorities suggest that motorists find alternate routes or allow for possible delays if they’re driving near the area. The NBC Washington traffic map will be updated throughout the day as roads open or close, so you can always check back here for the latest conditions; viewers can also follow traffic reporter Melissa Mollet on Twitter at @first4traffic. Drivers throughout the region should watch out for a large number of motorcyclists on the roads all weekend. As several other events surround the Ride for Freedom. The "Blessing of the Bikes" takes place at 5 p.m. Friday at Washington National Cathedral. Then at 9 p.m., there will be a candle light vigil at the Vietnam Veterans Memorial. Saturday's events include the Harley-Davidson Barbecue in Fort Washington, Maryland, from 10 a.m. to 4 p.m.